My name is Jeff Chan and I train under professor Adam Ryan at Dynamic Mixed Martial Arts in Vancouver, Canada. 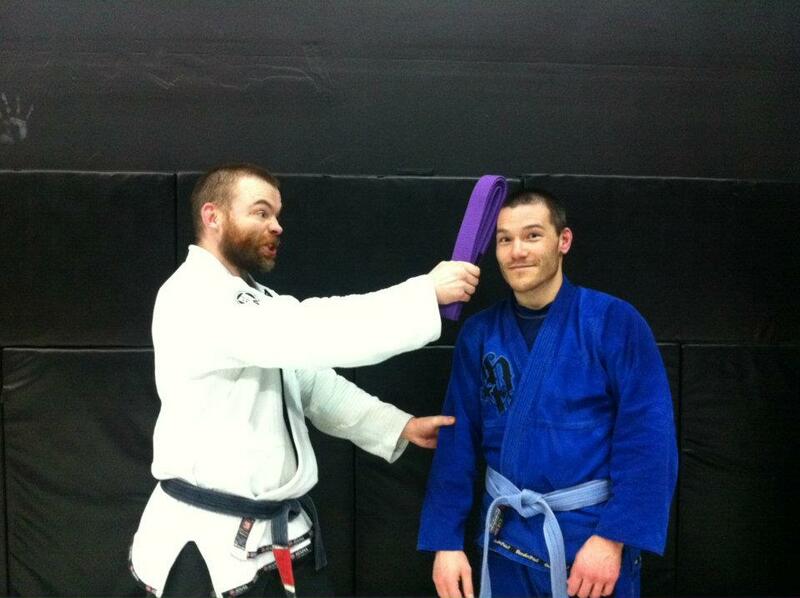 I’ve been hanging around there since June 2007 and was promoted to purple belt in January 2012. I was introduced to grappling through the Hart House Judo Club at the University of Toronto and trained there between 1999 and 2001, earning my blue belt from Senseis Don Smith and Mark Uemura. The six years in between were spent at Hastings Skatepark. I like chokes, closed guard, half guard, the knee-to-nose and smash passes, kneebars, ouchigari, deashiharai, and hizaguruma. My jiu-jitsu is like a fungus: slow, steady, persistent, and largely unexciting. Promotion night! Jeff and Cedric get their Brazilian jiu-jitsu purple belts in January 2012. You wouldn’t know what a purple belt was if I hit you over the head with it. Digging for a shoulder lock. Photo courtesy of David Levy-Booth of The Jiu-Jitsu Laboratory. At Hart House with the University of Toronto Judo Club in 2001. Front row: Ben Ganss, Paul Schelk, Bernie Sattin, Mark Uemura, Donald Smith, Igor Muskatblit, David Miller, Saeid (? ), myself (no idea why I’m with the black belts) and Antun Sisgoreo. Note special guest Carlos Newton hiding in the back row. Dynamic MMA head instructor Adam Ryan highlights some of the holes in my guard game using the knee-in-the-face pass (circa 2007). Getting down with some jiu-jitsu crosstraining at Hastings skatepark in Vancouver. Backside ollie from 8′ into 10’3″. Photo by John Raimondo. In my other life I’m a business copywriter. I have my own company, Apostrophe Writing Services and work closely with a strategic branding and communication agency called Living Blueprint. I do think your Jiu Jitsu is as exciting as a fungus, but then again I really like fungi.